Manchester-based maker of retro audio gear, GPO, has launched a new range aimed cost-savvy audiophiles; the new premium, yet wallet-friendly, PR range. 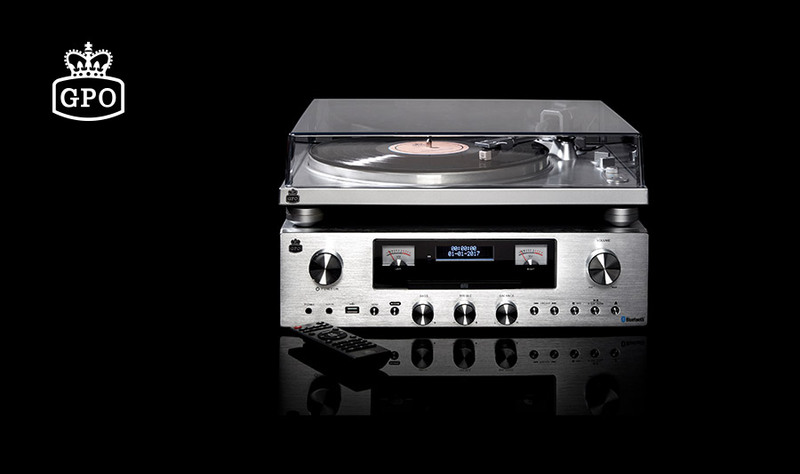 GPO’s first premium line is made up of a turntable and combo amp/media player. The PR100 turntable comes with an Audio Technica MM cartridge, pitch control, adjustable counterweight and anti-skating control, and a Bluetooth transmitter. It can spin vinyl at 33.3 or 45 RPM and has its own phono preamp, which is handy given that many modern hi-fi amplifiers don’t have their own phono stage. At the heart of the PR200 is two channel amp rated at 12 W RMS, which probably isn’t going to shake the foundations but should be loud enough to rock the pair of included bookshelf speakers. The unit is also home to a CD player, and DAB and FM radio. MP3 encoding capabilities means that the listener can also plug in a USB thumbdrive and convert vinyl or CD to MP3 directly through the PR200, while a Bluetooth receiver caters for streaming from the PR100, or any BT smartphone or music source. A slice of retro cool is served up in the shape of left and right analogue VU meters to the front. The GPO PR audio systems, scheduled for release next month, are available to pre-order now through Nimans Home.